I resolve to work earnestly toward my dream .I resolve to not care what people think about who I am or the choices I make. I resolve to not answer the question “What do you do for a living” because if I said what I am doing they would not understand. I resolve to answer the question “Why are you single?” with a blank stare. I resolve to do more of what I love and less of what other people would love for me to do. I resolve to change the world by the way that I live and not by what I say. I resolve to LOVE people regardless of whether I know them or not, but love them just because we are here on earth together. I resolve to dance more often with or without music. I resolve to get away more, build more tents and gaze at more views. I resolve that I am different, I don't fit in, no one truly gets me and I think God made it that way so I would learn to solely trust in him. I resolve to not engage false company, life is too short. I resolve not to jump into a box full of labels just to make someone feel comfortable with who I am. I resolve to not diminish myself; YES I am as great as they think and NO I will not apologize for it. I resolve to be even more awesome then I was last year so if I wasn't liked then, BRACE yourself! I resolve not to apologize for my love of Jesus, it is through him that I am so amazing and his love that has helped me overcome, if that makes someone feel uncomfortable maybe they should stick around this site a little longer and find out why. I resolve to shake off all the self-inflicted expectations of this this world, people and society and just LIVE. 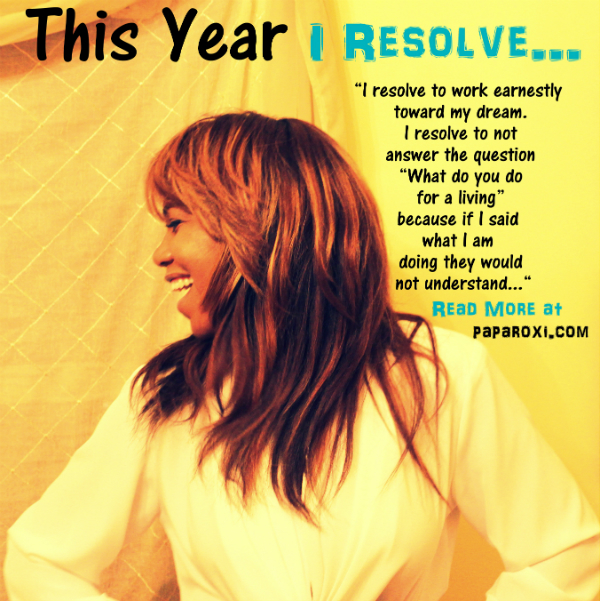 This year I resolve to be GREAT.